GOT MICE? …. GET A BARN BUDDY! Rodent Control Technician will do chores in exchange for room and board. Sometimes UPAWS receives cats that, for various reasons, cannot live as indoor companion pets. These cats become part of our Barn Buddy Program and are in need of a home on a farm, horse stable, or other suitable outdoor location. This program offers them a chance at a safe life that is best for them. ~ The barn/building must be a protective, insulated enclosure which the cat can easily enter. The cat must have access to a heat source during winter months. We offer that you take two or more Barn Buddies because they provide each other with companionship and socialize together which is good for their mental health. Placing two or more cats together helps to ensure a successful transition. 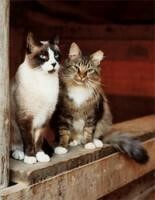 UPAWS has many more helpful hints to help these wonderful cats adjust to your barn environment. Thank you for considering a new Barn Buddy and helping UPAWS save lives!